DERRY CITY Football Club has announced a substantial six figure sponsorship deal with local packaging company, Diamond Corrugated, a partnership which will run until the end of the 2019 Airtricity League season. The generous sponsorship package, which is in excess of £100,000, is the largest in the club’s history and, following successful negotiations between the parties, ensures Diamond Corrugated will remain as the club’s main shirt sponsors for the next three years. My father was a big supporter of Derry City which triggered my passion. It’s the reason I chose red, white and black many years ago as the colours for Diamond Corrugated,” he revealed. The news coincided with confirmation that Derry will play their ‘initial’ home games in the Airtricity Premier Division at Maginn Park in Buncrana. 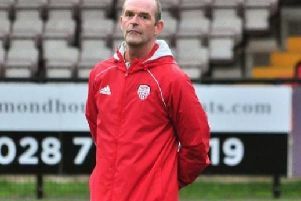 The Diamond sponsorship is a very welcome early Christmas present for the ‘Candy Stripes’ and City boss, Kenny Shiels, who is putting the final touches to his 2017 squad as they look ahead to another UEFA Europa League campaign. Paul Diamond, managing director of Diamond Corrugated, has not only been a life-long supporter of Derry City but was the chairman of the club in the mid-90’s, including the year Derry City last won the Premier Division title in the 1996/1997 season. For the past six years Diamond Corrugated has graced the front of the club’s jersey and Mr Diamond said he was ‘proud’ to have signed a contract for a further three years. “The club means a lot to me and I am happy to have signed a contract for a further three years,” said Paul. “My father was a big supporter of Derry City which triggered my passion. It’s the reason I chose red, white and black many years ago as the colours for Diamond Corrugated,” he revealed. Derry City Chairman, Philip O’Doherty is ‘delighted’ to agree the new bumper sponsorship deal with Diamond Corrugated. The Pennyburn based packaging company extended its long association with the ‘Candy Stripes’ and the City Chairman is ‘especially grateful’ for the company’s continuing support, insisting the new deal is about ‘more than a name on a jersey’. “I’m delighted with this new sponsorship deal from Diamond Corrugated,” said Mr O’Doherty. “Paul Diamond has been supporting Derry City for over 20 years and I especially am grateful for his continuing support as we get ready to move into the new Brandywell. “Paul and I both came on board with Derry City in 1995, Paul as Chairman and myself as Vice Chairman, and he knows what’s involved in the running of a football club. So the fact that he has agreed to another three years is fantastic. And Derry City’s Commercial and Marketing Manager, Orlaith Meenan said the club couldn’t ask for a better company to deal with. “I personally couldn’t ask for a better company to sponsor the front of the jersey, Paul is a tremendous business man and not only cares how we perform as a team on the pitch but has a keen interest in how we as a club perform off the pitch,” she said.